What makes a "good" mom? We all do the basics of a "good" mom, you know what I mean: love, food, time, talking, clean clothes, activities... Recently I looked at a cabinet I store photos in and FREAKED OUT, immediately the idea of being a "bad" mom popped in my head. I am NOT a scrap book kind of girl, but I am a smile for the camera kind of mom (constantly). Which if you take as many pictures as I do, you would agree that I should be some kind of scrap booking Guru. I do the digital thing, and even make photo books online occasionally, but this cabinet I just opened (like Pandora's box) was filled of photo's of just ONE of my children from many years ago (child number two has a seperate cabinet). I am a terrible mom, I can not cook meals, keep the house clean as well as all the clothes, run children to millions of activities, occasionally blog and SCRAP BOOK! I can cook, clean and run my full time taxi service but yet the fear of leaving all these photos loose and in no kind of order or sense makes me feel like a loser of mom! Please tell me I'm not alone. Maybe I am, maybe all the other moms of the world are secretly staying up late scrap booking every event and moment of their child's life. They must be, I went to Michael's (hobby/craft/crap store) to get photo pages (my guilt won) and they have ISLES and ISLES and ISLES of paper, stickers, stamps, gadgets and crap dedicated to all things photo related. After leaving the crap store my curiosity (guilt) struck again and I went online and hit Pinterest and Blogs (Project Life blog) to investigate the scrap booking world. UGH!!!!!!!! 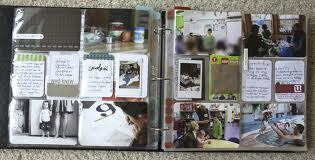 There are moms with with entire rooms devoted to all things scrap booking! I'm not judging, I have entire workroom/office dedicated to all things decorating, gift, entertaining, blogging, etc.... and it's beautiful and workroom is an overrated title (I doubt much "real" work takes place in my workroom). I do think for a minute or two while reading scrap booking blogs I might have had a meltdown. What is a "good" mom, I know I'm hitting all the majors: love, food, fun, car service.... but when do we say enough, I can't, not one more thing, please dear LORD no, when do we say TO HELL with capturing EVERY memory with paper and stickers?? I am a total loser and surprised I've not become a drug addict because I completely folded to all the pressure of scrap booking and bought the pages and paper (and yes a few stickers). As I'm standing in the middle of scrap booking HELL at Michael's (crap store) I hear this voice in my head ( a friends voice) repeating, "your children will thank you, when you are dead they will not have to go through all those photos and sort them out and figure what's what and who's who." She has a point, but then one of my family members have been know to say, "what will it matter when I'm dead, I won't be around." I guess they have a point to. UGH!!!!!! Cross your fingers, say a prayer, ANYTHING because I'm now committed to this GIGANTIC project. Two children (14 and 9), about a MILLION photos in boxes and envelopes. So far I have birth to age 5 sorted for one of my children, and I'm pretty sure if I stop now my son will tell me his sister is my favorite and the proof is her neatly organized photos of her childhood. Hopefully it will not come to that and since I've had surgery on my foot this past Friday I'm thinking this boot I'm wearing will motivate me to work on the task at hand. I need to start a once a week Non scrap booking / scrap booking group that meets for an hour to put our children's photos in a book. With a few rules: NO stickers, stamps, gadgets and glue. Only photo pocket sheets, pens and paper (the Project Life method, which is based on being quick, basic and to the point). The basics and skinny margaritas, I can do it....we can do it! I'm just as guilty....I've got one of those closets and keep thinking "one of these days" I'm going to tackle that scrapbook land...I have plastic bins labeled "for scrapbooking"....but I need to probably take off one summer to finish! It will happen in the "right season"...I know it will!